Patriarch Kyrill of Moscow and all the Russias has urged Russians to think about the ultimate causes of the fires that continue to rage in Russia and draw appropriate conclusions. ‘The most important thing for us today is to spend more time thinking about our responsibility before God for ourselves, for our neighbours and for the natural world around us’, said His Holiness after serving the liturgy and blessing the new church at the St Stephen the Wonderworker Convent near Vladimir. The Patriarch noted that the ultimate cause of the fires was deliberate misconduct of which the root was in barbaric attitudes towards the natural world. It was a result of the inner nature ‘of those accustomed to satisfying their lusts’. ‘They are quite indifferent to the consequences of their acts. All those who have polluted our forests and environment are responsible for the destruction of property and the deaths in the fire’, emphasised the Patriarch. ‘Everywhere you walk in the woods outside any city, you see piles of rubbish, huge amounts of broken glass, plastic bottles and bags…all things that focus the power of the sun. This has contributed to the spontaneous combustion of the forest in the heat wave. We have burned ourselves, the forest fires were the response of nature to feckless human behaviour, the root of which is human sinfulness. 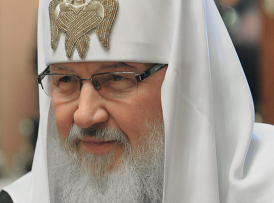 Our national wealth has diminished before our eyes, we have become poorer, we have lost lives, and not just those who died in the fires… after all, how many sick people died of asphyxiation from the smog that invaded our cities?’ asked the Patriarch. He expressed his hopes for the future, saying, ‘This sign was given to us by Heaven, it should at last force us to reconsider things and make a fresh start in life. We fervently pray that the Lord will send rain on our land and we believe that those rains that have occurred were a small, but still real, sign of God’s mercy to us. We believe that the Lord will sustain us through this ordeal. Human wisdom comes from the ability to learn lessons from life. May God grant that our people pass through the fiery trial of the long hot summer of 2010 and that they learn the spiritual lessons of this self-imposed calamity’, concluded the Patriarch. Meanwhile, the head of a large dairy company near Moscow has informed his 6,000 workers that company policy will require all employees to follow closely the teachings and precepts of the Russian Orthodox Church. Vasily Boiko-Veliki, director of Russkoe Moloko (Russian Milk), told a local radio that the company had been set up to promote the revival of Orthodox Russia and the rules were meant ‘to prevent future sins by employees’. He added: ‘We have about 6,000 employees, most of whom are Orthodox, and I expect them to be faithful and to repent’. Answering the question if he employed only Orthodox believers, Boiko-Veliki said, ‘There are no restrictions, but it is mostly baptised people who come, whose goals in life coincide with ours, the Orthodox transfiguration of Russia’. The new rules require all Orthodox Christian employees who are civilly married or living together to be married in Russian Orthodox Church ceremonies by 14 October, the feast of the Protection of the Mother of God, or face the possibility of dismissal. Newly-hired Orthodox employees who had been married in civil ceremonies would be given three months to have a religious wedding. Mr Boiko-Veliki explained that those who are not baptised do not have to marry in the church, but all employees will be able to take an educational course in basic Orthodox culture. The new rules also state that anyone procuring or counselling abortion would face dismissal from work. ‘Abortion is the murder of someone. We do not want to work with murderers’, said Boiko-Veliki. The Russian businessman commented on the prolonged heat wave and resulting forest fires that are plaguing the Western part of the country and said that a return to the practices of the faith, such as the sacrament of marriage, could improve things. ‘This summer of abnormal heat and drought is a judgement on Russia’s godless ways, said Mr Boiko-Veliki to Gazeta.ru. ‘Our prayers are probably too weak and there is no repentance in our hearts’.